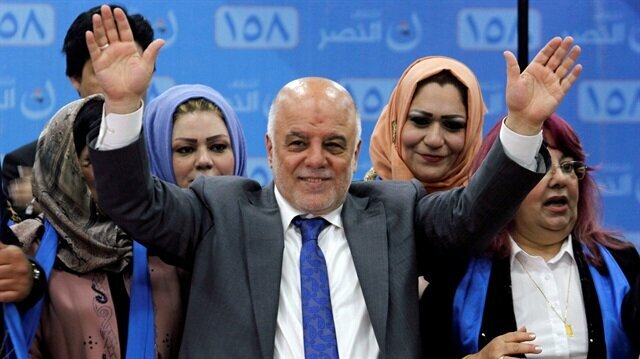 FILE PHOTO: Iraqi Prime Minister Haidar al-Abadi attends the election campaign, along with his supporters in Kirkuk, Iraq. Prominent Iraqi Shia cleric and politician Muqtada al-Sadr on Thursday called on Prime Minister Haidar al-Abadi to resign from his Dawa Party in return for securing a third term in office. Since last week, Iraqi electoral officials have been manually recounting ballots cast in the country’s May 12 parliamentary poll, official results of which remain dogged by dispute. According to those results, Al-Sadr's Sairoon coalition dominated the vote, winning 54 parliamentary seats, followed by a Hashd al-Shaabi-linked coalition (47 seats) and al-Abadi's Victory Bloc (42 seats). U.S. President Donald Trump hailed a personal victory at a NATO summit on Thursday, saying allies had sharply increased defence spending commitments after he provoked a crisis session with a tirade at European leaders. "I told people that I would be very unhappy if they didn't up their commitments," an ebullient president told reporters after the second day of the Brussels meeting, when NATO leaders huddled with Trump to try to defuse a crisis. "I let them know that I was extremely unhappy," he said, but added that the talks had ended on the best of terms: "It all came together at the end. It was a little tough for a little while. "Officials at the meeting said Trump had shocked many present and broke with diplomatic protocol by addressing German Chancellor Merkel by her first name, telling her: "Angela, you need to do something about this". Most officials and the invited leaders of non-NATO Afghanistan and Georgia were ushered out.Trump tirade sends NATO leaders into crisis sessionOthers in the room, including the Lithuanian president whose country is among the most nervous of Russian ambitions, denied a suggestion that Trump had threatened to quit the alliance.When asked about that, Trump said he believed he could do that without Congressional approval but it was "not necessary".Instead, he said, the other 28 allies had agreed to increase their defence spending more quickly to meet a NATO target of two percent of their national income within a few years. The current commitment is to reach two percent by 2024 but with get-out terms that would allow some to stretch it out to 2030.Trump stressed that NATO's budget had been unfair to the United States but now he was sure it would be fair. Allies would be increasing spending by $33 billion or more, he added.He also said he thought spending of 4 percent on defence -- similar to the U.S. level -- would be the right level.Trump keeps up spending demands at NATO but turns on charm"TOTAL CREDIT TO ME""We have a very powerful, very strong NATO, much stronger than it was two days ago," he said. Citing the alliance's Secretary-General Jens Stoltenberg, he said: "Secretary Stoltenberg gives us total credit, meaning me, I guess, in this case, total credit. Because I said it was unfair. ""The numbers have gone up like a rocket ship ... and they're going to be going up further," he said. "Everybody in that room got along and they agreed to pay more and they agreed to pay it more quickly. "Merkel said: "We had a very intense summit. "Trump had opened the first day of talks in Brussels on Wednesday with a public diatribe against Germany, the second biggest state in the Western defence alliance, criticising its reliance on Russian gas imports and failure to spend more on defence.After Trump's spending demands, NATO summit turns to AfghanistanThe mood had appeared to have calmed as the summit went into its second day, focusing on operations beyond Europe. But, several sources said, Trump instead reopened in strong terms his demand that other countries spend more immediately. "The language was much tougher today," one source told Reuters. "His harshest words were directed at Germany, including by calling her Angela --'You, Angela. '"As well as Merkel, Spanish Prime Minister Pedro Sanchez and Charles Michel, the prime minister of Belgium, were singled out by Trump for undershooting on their spending targets when U.S. taxpayers, funding a defence budget worth about 3.6 percent of their national income, foot much of NATO's bills.Video: Trump says 'no more nuclear weapons' would be ultimate goal of Putin meetingTrump says 'ultimate deal' with Putin would be world without nuclear weaponsPresident Donald Trump on Thursday said the best agreement he could have with Russian President Vladimir Putin would be one where there would be no nuclear weapons in the world.Asked what would be the best possible result from his meeting with Putin, Trump said: "What would be the ultimate? Let's see. No more nuclear weapons anywhere in the world, no more wars, no more problems, no more conflicts. ... That would be my ultimate. "Trump is due to meet with Putin on Monday in Helsinki.US says disrupts Iran finance operation in UAE to squeeze TehranIran treating U.S. with more respectU.S. President Donald Trump said he expected Iran to call him one day with an offer to allay U.S. security concerns, saying Tehran was treating Washington with much more respect after he pulled the U.S. out of a nuclear deal. "They're treating us with much more respect right now than they did in the past," Trump told reporters after a summit of NATO leaders in Brussels. "I know they're having a lot of problems and their economy is collapsing. But I will tell you this: at a certain point they're going to call me they're going to say 'Let's make a deal'. They're feeling a lot of pain right now." EU Commission cuts euro zone growth forecasts, blames trade warsU.S. will hit EU cars if no good faith in trade talks U.S. President Donald Trump warned the European Union on Thursday that the United States would act to restrict entry for European cars if the bloc failed to treat his country fairly on trade.Trump, who is set to host European Commission President Jean-Claude Juncker in Washington this month, repeated his line that the EU was treating the United States unfairly on trade, shutting out U.S. farmers. "That'll change also and I think we'll see that because on the 25th of July they're coming in to start negotiations with me. We'll see," he told a news conference at the end of a meeting of NATO leaders. "And if they don't negotiate in good faith we'll do something having to do with all the millions of cars that are coming into our country and being taxed at a virtually zero level, at a very low level... I think it's been a very effective way of negotiating, but I'm not negotiating, I just want fairness for the United States," he said. Al-Sadr seeks to form a new government “far from sectarianism or narrow political interests” with a mandate to fight corruption and carry out long-awaited reforms. “We’re looking at new ways of drawing up coalitions in line with our reform plans,” Diaa al-Asadi, head of al-Sadr’s political bureau, told Anadolu Agency. According to al-Asadi, talks remain underway between Sairoon; the Victory Bloc; the Hashd al-Shaabi-linked Al-Fatah Bloc; the National Wisdom movement (led by Ammar al-Hakim); and the Al-Wataniya Bloc (led by Vice-President Iyad Allawi). Nevertheless, the choice of prime minister remains subject to considerable debate, al-Asadi said. It appears that PM al-Abadi still has a chance to secure a third term in office if he is willing to resign from the Islamic Dawa Party, of which former PM Nouri al-Maliki is also leading member. According to al-Asadi, al-Abadi’s resignation from the Dawa Party is a chief demand of most leading political blocs, including al-Sadr’s Sairoon coalition. Al-Sadr also holds al-Maliki responsible for the Daesh terrorist group’s ability to overrun much of the country -- including Mosul -- in mid-2014. Al-Asadi also downplayed the extent of “foreign influence” on Iraq’s electoral process. Dozens of Palestinians and employees of the UN Relief and Works Agency for Palestine Refugees (UNRWA) demonstrated outside the UNRWA’s Gaza headquarters on Thursday to protest planned reductions to the agency’s services.Established in 1949, UNRWA provides essential services to Palestinian refugees in the blockaded Gaza Strip, the occupied West Bank, Jordan, Lebanon and Syria, who have been displaced by Israeli occupation and conflict.“We are protesting today… to send a message to UNRWA that its plans to dispense with some employees is unacceptable,” Amal Batch, deputy head of UNRWA's employees’ union, which helped organize Thursday’s demonstration, told Anadolu Agency.“UNRWA’s downsizing plans will not solve its ongoing financial crisis,” she said.Video: Palestinians protest UNRWA cuts in GazaBatch went on to point out that UNRWA Commissioner-General Pierre Krahenbuhl had earlier promised to maintain the agency’s staff and the many services it provides to Palestinian refugees.She urged Krahenbuhl to keep his promise and refrain from sacking agency staff members, especially those involved with crucial relief programs.In an earlier statement, the employees’ union asserted that the agency had cancelled one of its emergency programs last month, threatening the food aid provided to some 1.3 million refugees in Gaza.The union also said that the UNRWA had terminated the temporary contracts of “dozens” of its engineers within the last four months.Earlier this year, the U.S. suspended $65 million of $125 million in planned funding for the UNRWA after the Ramallah-based Palestinian leadership rejected any U.S. role in the Palestine-Israel peace process.The move by Ramallah came in retaliation for U.S. President Donald Trump's decision last December to unilaterally recognize Jerusalem as Israel's capital. Known for his hostility to the U.S., al-Sadr led a faction of Shia fighters against foreign forces during the U.S.-led occupation of Iraq from 2003 to 2011. He is also one of a small handful of Iraqi Shia political leaders who are not closely associated with Iran. Since the regime of former Iraqi President Saddam Hussein was overthrown by U.S. and U.K. forces in 2003, both Washington and Tehran have played significant roles in the talks leading up to the formation of successive Iraqi governments.